Towering pillars of smoke are rising over south-central Alaska from wildfires that have burned tens of thousands of acres, put residents on alert for evacuation and caused unhealthy air conditions in the state’s largest city. 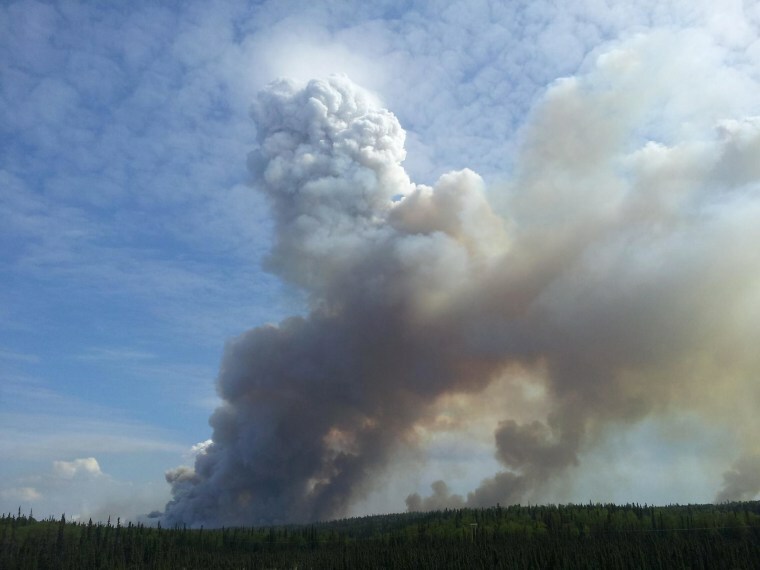 The biggest blaze is the Funny River fire near Soldotna on the Kenai Peninsula south of Anchorage, which by Friday afternoon had burned more than 67,000 acres, NBC station KTUU of Anchorage reported. No evacuation orders have been issued, although one subdivision was advised to be ready to evacuate if necessary. Nearly 400 firefighters are battling the fire. Friday afternoon, southwest winds gusting to 20 mph were predicted, which could push the flames closer to Soldotna. Open fires of any kind were banned in Kenai Peninsula state parks and the Chugach National Forest on the peninsula, the Alaska Interagency Incident Management Team said on its Facebook page. A smaller fire of about 2,000 acres was burning across Cook Inlet from Anchorage, near the villages of Beluga and Tyonek. Smoke from the fires had made air quality unhealthy in parts of Anchorage on Thursday, but air quality improved to good on Friday, KTUU reported.